Today, like so many other authors are trying to do, I am exercising my liberty to tell America’s people what they don’t seem to want to hear. 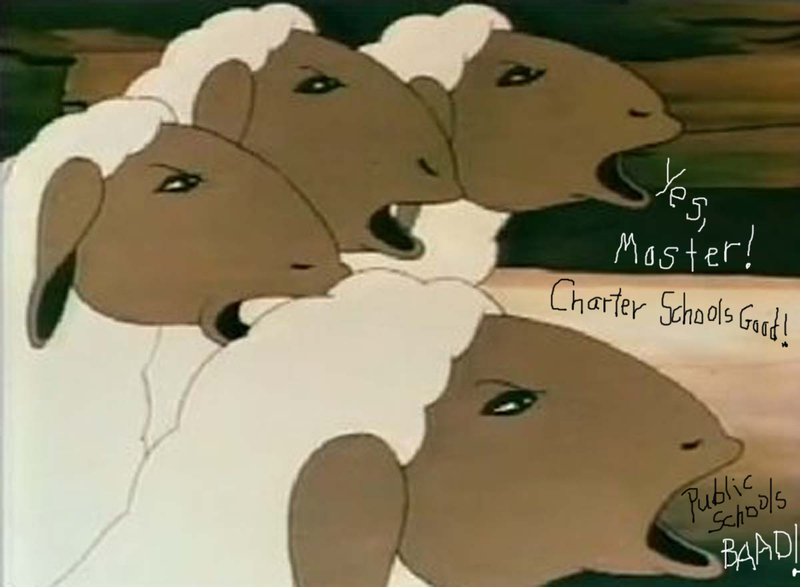 I am telling all of you that YOU are being led by the nose, by none other than “Pig Brother” like sheep to the slaughter in a Charter School Movement that is successfully throwing America’s Constitution out the window. Our own House of Representatives recently passed H.R. 2218, which will mandate the implementation of Charter Schools in EVERY state, ignoring our own Constitutional Amendments and laws that have been governing equality and civil rights for years. 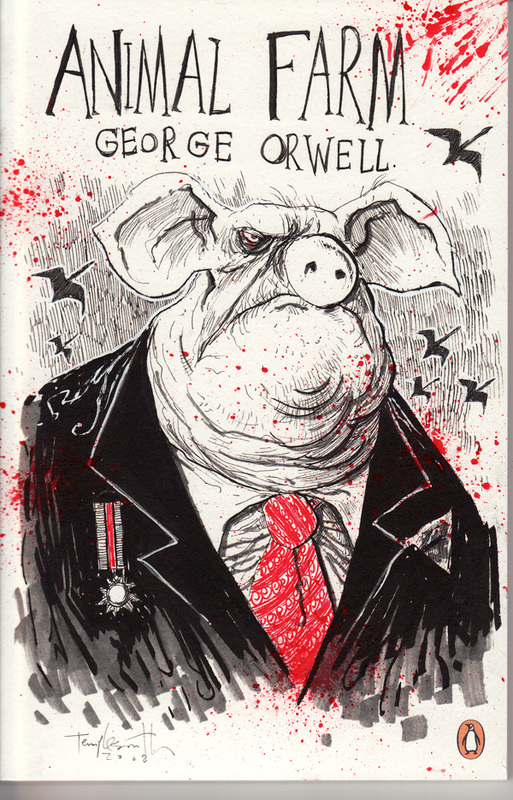 The promoters of this bill and the privatization of America’s public schools are using the tried and true tactics of lies and propaganda, much like Orwell’s Animal Farm (1945). Bill Gates is using these bankrolled ‘education advocates” to get the public behind his evil plan to monopolize education. “To the world we all know, which may or may not be the best world possible, once again, springtime had come. 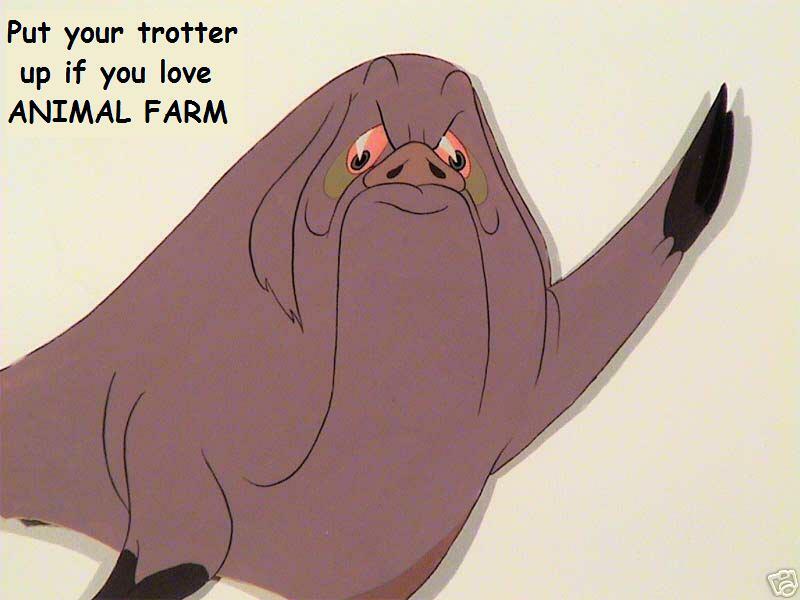 But all the magic of spring was not enough to conceal the misery of Manor Farm. These ‘grassroots’ meetings are being hosted by League of Education Voters, bankrolled by Bill Gates, and offered with slick marketing to gather public support that is effectively stripping our children of the protections they need under Federal and State laws. 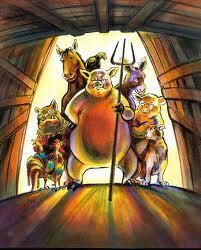 “Soon after, the pigs set up a study-center for themselves in the harness-room. Snowball embarks on various campaigns for social and economic improvement. Napoleon opposes whatever Snowball does. Because most of the animals lack the intelligence to memorize the Seven Commandments, Snowball reduces them to the single maxim, “Four legs good, two legs bad.” The sheep take to chanting this at meetings. 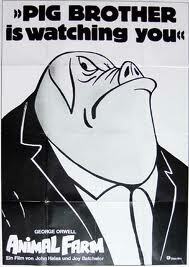 As time goes by, the pigs increase their control over the animals and award themselves increasing privileges. 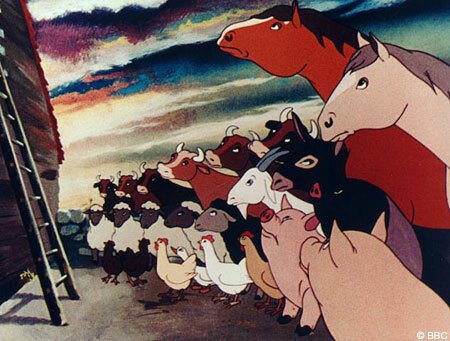 They quell the animals’ questions and protests by threatening Mr. Jones’s return. Bill Gates and these brain-washed groups take on the role of creating “Sheeple” convincing them to give up their rights, to take away the rights of others, all to privatize and promote the policies and increased privileges for upper-class -white-English-speaking-straight-mostly-Christian-American-born-school-age-children through Charter Schools. In this post I will EXPOSE League of Education Voters, one of the so-called “Grassroots Education Advocacy Groups” who are propagandizing Charter Schools. 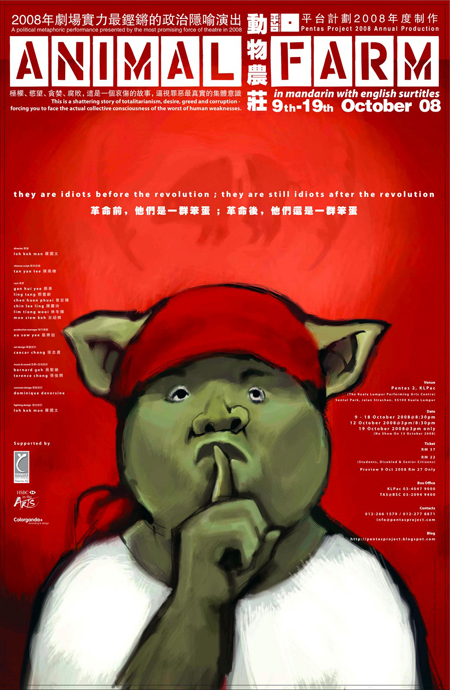 These Charter Schools, and Bill Gate’s own words, like the words of propaganda used in Orwell’s Animal Farm — are often preaching to us from on high, using the language of ‘choice’, ‘freedom’, and ‘civil rights’ as outlined in my own blog “The White Shadow: Bill Gates, Charter Schools, and the Evil Twins”. This re-segregation is repeated more and more across our country, harming the lives of so many of our children, our families, our teachers, and our public schools. Charter Schools in Louisiana, New York, Chicago, and many other cities/states across America are not held by the same standards being MANDATED by our Federal and State governments. 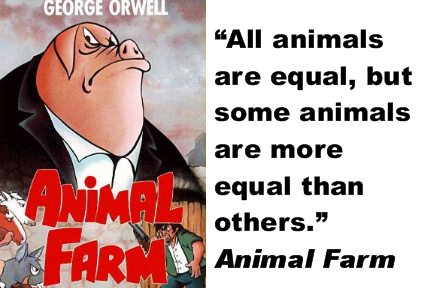 Through tax payer dollars they are padding their own pockets while they set up their own RULES, much like the animals did in “Animal Farm“. Here are “Gate’s 5 Rules of Charter Schools Good, Public Schools Bad” established in many of the US Charter Schools across America that are being treated as if they are not ‘governed’ by the rule of our own US Constitution and state constitutions, as well as Brown vs The Board of Education [ironic as it was also established in 1954], Individuals with Disabilities Education Act, American Disability Act, Title I, and more laws that govern all PUBLIC schools. “The purpose of this paper is to deconstruct the new racist discourse within an urban charter school. 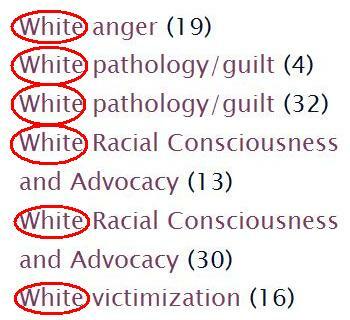 We especially want to focus upon how the new racist discourse as according above to Giroux (1999) relieves Whites, “of any semblance of social responsibility and commitment.” As multiculturalism and political correctness are being taught and encouraged in our society to work against inequality, they are simultaneously being used by some Whites, particularly the middle and upper classes, to separate themselves from the “bad” Whites, whom are largely framed as the working-class and poor. As a result, a White liberal rhetoric has been developed that talks about “diversity” and “democracy” but does not address power and current racial inequities. Consequently, racism becomes defined as an individual act rather than being attributed to institutional policies and structural issues of privilege in our society. Whites who adopt a pseudo-liberal rhetoric of promoting diversity without pushing for the change of institutional or structural issues then define themselves as “innocent” and absolved of their participation in reproducing racial inequities. For example, often racist attitudes and behaviors get attributed to ignorance, which implies that the people did not really know any better. On the contrary, Whites do know about racism in society and are often choosing carelessly to reproduce it rather than work against it (Groves, 2002; Otto, 2002). “Editor’s note: The study excerpted in this issue of The Term Paper was written by Chungmei Lee, a researcher with the Civil Rights Project at Harvard University. “Denver Public Schools have resegregated dramatically by race and socio-economic status since court-ordered busing ended a decade ago, according to a new study commissioned by The Piton Foundation. The adverse impacts of segregation will continue disproportionately affecting Denver’s low-income, minority students, unless creative measures are taken to foster more integrated schools for all students, the study concludes. “But the various solutions to improve high poverty schools—more money, charter schools, and federal accountability measures—have not worked. Some liberals, frustrated with integration, argued that “we should concentrate on desegregating the money,” as Derrick Bell put it. Yet as Ryan notes, “most city schools spend above the state average” without showing great results. Indeed, a recent Century Foundation study of public schools in Montgomery County, Maryland found that low-income students in low-poverty neighborhoods who attended low-poverty schools significantly outperformed similar students who attended higher-poverty schools, even though those schools spent considerably more on class size, professional development for teachers, and extended learning time. 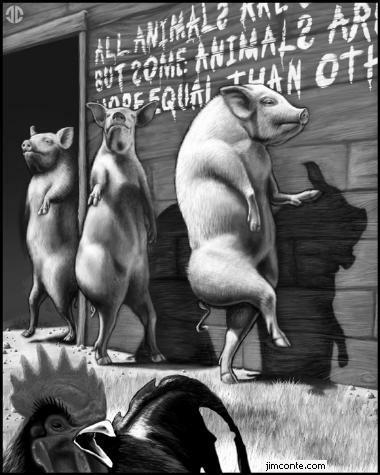 Napoléon: All animals are equal, but some animals are more equal than others. Jessie: But they’re my babies. Squealer: If you were thinking clearly, then you would be pleased of the special education that we’re going to give them. You surely don’t want to disadvantage your own puppies. Do you? Parents of kids in special education beware: Special education is under attack by the GOP across the nation via the American Legislative Exchange Council (ALEC) — a powerful coalition of corporations and right-wing legislators, and viewable on the web site ALEC Exposed. ALEC has worked out plans to trick families into giving up their federally protected educational benefits in exchange for cheap vouchers that can be used in unregulated, fly-by-night academies. The best example of this is Florida’s (Jeb Bush) McKay special education scholarship fund, and the best proposed bill is AB110 in Wisconsin. How does the scam work? “It is predicated on trading on parents’ legitimate frustrations for what their kids are not receiving and then sprinkle magic fairy dust by saying, ‘Here, we’ll give you a voucher and all your frustrations will go away,’” says Jeff Spitzer-Resnick, attorney for Disability Rights Wisconsin (DRW). What most parents don’t understand is that disabled students who take advantage of special education vouchers forfeit their rights under the federal Individuals with Disabilities Education Act (IDEA). That is, they no longer have a right to a “free, appropriate public education” or the specific services that come along with that. Additionally, they give up their chance to get school districts to cover the costs of private education, if the local public schools can’t meet their needs. Embedded in IDEA is the ability to either voluntarily or legally force school districts to pay for private schools. Even if parents don’t believe vouchers siphon off public funds, there is the very strong motivation for running cheap schools for the disabled: test scores that are required by No Child Left Behind. An August editorial from the Orlando Sun-Sentinel called on Florida’s republican legislators to reveal their alignment with the American Legislative Council. The Koch brothers funded organization known by the acronym ALEC, was involved in writing anti-union bills in Florida and elsewhere. Loudon seems to feel that ALEC may have been involved in extending McKay similarly. “What is so unfortunate for the children and parents is that the charter school model was sold to them as an inclusive entity, when in reality it is an exclusive entity that selects students just like magnet schools or any other private selective admission school. 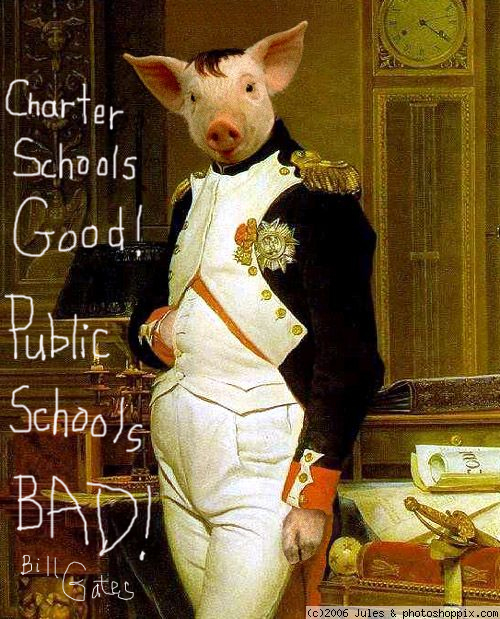 As a result of the BESE board decision, charter schools have become “Gated Public Schools” for thousands of children. 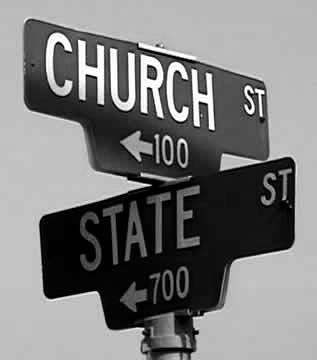 Some legal suits against the use of vouchers for religious Charter Schools are beginning to take root and bear fruit, but shouldn’t this become a national suit as these vouchers clearly appear to violate the 1st Amendment of the US Constitution? 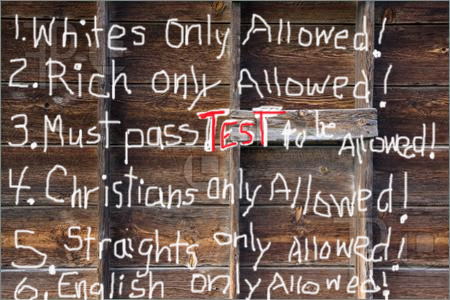 While I make the rule “Christians Only Allowed” to make my point of our country’s majority religion, Christianity is not the only religion jumping on the voucher system band wagon! Due to the lack of regulation of the so called “Public” Charter Schools which are REALLY PRIVATE schools funded by America’s public tax payers, there is a grave concern about the allowance of prejudice towards the LGBT students. schools like New York City’s Harvey Milk High School. But the decentralized nature of charter school governance leaves them particularly susceptible to homophobic policies. Given the increasing popularity of the charter school movement, it is important to advocate for the inclusion of LGBT-friendly curricula and policies at all such schools. Clearly our civil rights are being violated daily by the implementation of Charter Schools. Clearly the US Constitution and Education Acts have been taken over by the “Gate’s 5 Rules of Charter Schools Good, Public Schools Bad” . On what grounds are our own legislators allowed to throw out the laws of equity under our own Constitution and Education Acts? Why haven’t the NAACP, ACLU, and Southern Poverty Law brought suit against the Federal Government and all 50 states who are clearly breaking these laws of our land? Why don’t we dump Bill Gates like NYC dumped Rupert Murdoch before it is too late? And finally: Will you stand up for civil rights for ALL children in America? Or will you let these Orwellian Corporate Philanthro-PIRATES and our own legislators, our own President, and our own Supreme Courts get by with breaking the law? 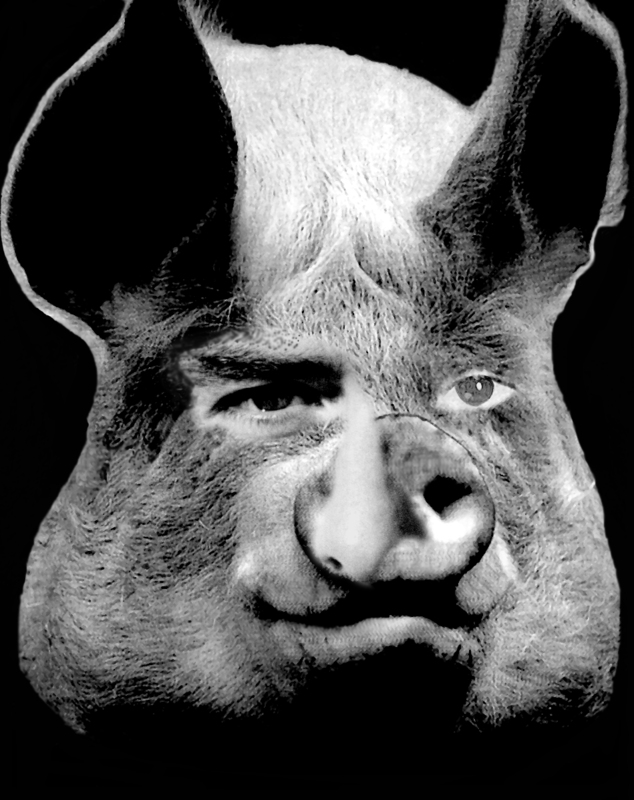 Where is the public outrage, the Federal and State lawsuits, and why aren’t union leaders taking on “Pig Brother” in a general strike for the civil rights issue of our era? This entry was posted on Monday, September 19th, 2011 at 1:29 am	and tagged with Animal Farm, Bill Gates, Charter Schools, Civil Rights, Constitution, H.R. 2218, Privatization, Public Schools, Racism, Separate but Unequal and posted in Charter Schools, Civil Rights, Vouchers, War on Public Education. You can follow any responses to this entry through the RSS 2.0 feed. Thank you this thoughtful post. I am sharing widely. Thank you for this thoughtful post. I’m sharing widely. Thank you for sharing. We need to get this the influence of these Privateers into the mainstream news. I appreciate you sharing this information widely in hopes of stopping the privatization movement. Recently on CNN Fareed Zakaria introduced Bill Gates saying “You are more powerful than the Secretary of Education.” I wonder why the public doesn’t see the danger in this? We need to get corporations out of public education.